The race is definitely on, folks! GBRow 2013 leaders, the Islanders, have made more than 40 miles overnight. With the wind still behind, skipper Josh Taylor and his crew in the Black Oyster are catching up on the world record. Yesterday, with the wind and tide in their favour, they reached a top speed of 7.8knots on the Durham coast. 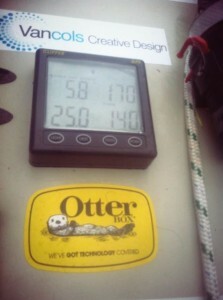 Our photo, right, shows the Black Oyster’s speedo recording 5.8knots. The Islanders are now almost at Scarborough, with 256 miles to the finish, and if the wind says in a north-westerly direction they may strike out from Flamborough head, straight to Norfolk to cut off the corner. Keep your eyes on the tracker. Race Director Chris Usborne reports that the Islanders seem to have managed to repair their watermaker and overcome problems with their power supply. To beat the current world record for the fastest time ever rowed around Britain – 26 days 21 hours 14 mins – the Islanders, Josh, Alan Morgan, James Plumley and Gavin Sheehan, need to arrive at Tower Bridge in London before 05.30 on Friday morning.